I am blessed with friends. Even more so because one of them lives in Savannah, which is a cemetery hopper’s paradise. Frank and I have been friends since junior high. We were in church youth group together (along with our pal Steve Reagin) and our fathers were both deacons. He was in his senior year and editor of the school newspaper when I came on board as a staff writer. 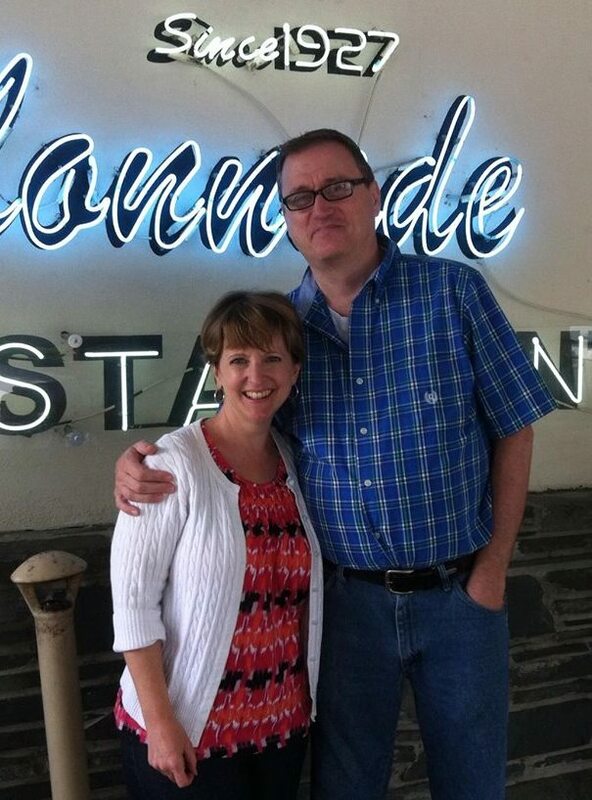 Thanks to Facebook, we got caught up last year and met for lunch at the Colonnade (one of the best places in Atlanta for fried chicken!). A lot of time has gone by but we still get along like two peas in a pod. 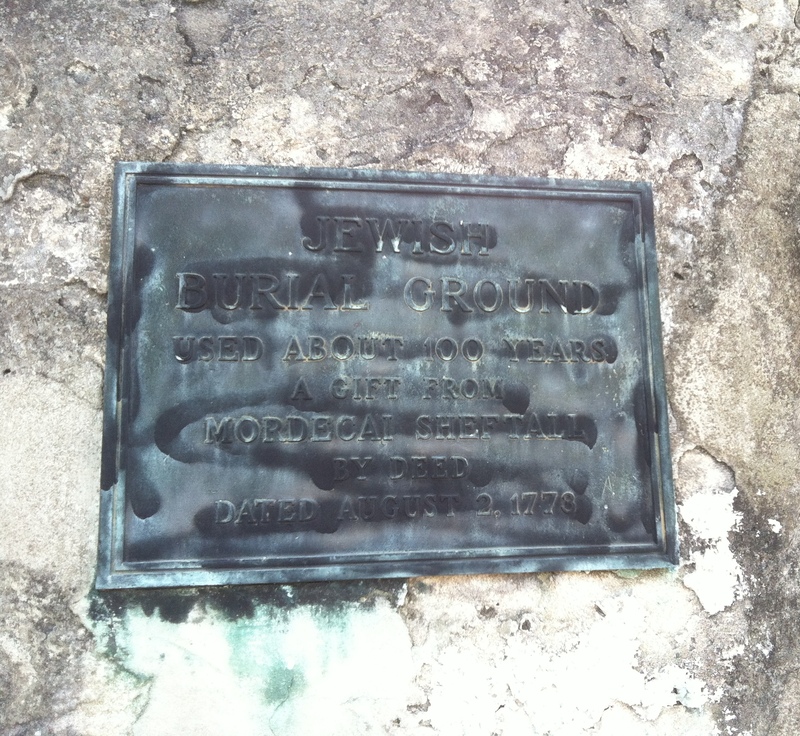 I found out about Savannah’s Jewish roots when I visited with my husband some years back. We toured the Temple Mikve Israel, the only Gothic Revival-style synagogue (consecrated in 1878) in the country. Our tour guide, a Holocaust survivor, filled us in on Savannah’s history of having an active Jewish community. The current building of the Congregation Mikve Israel was built in 1878. It’s the only Gothic Revival-style synagogue in the U.S. Photo courtesy of Congregation Mikve Israel. On July 11, 1733, 43 Jewish immigrants from Europe arrived in Savannah on the ship the William and Sarah. Their trip was paid for by members of a London synagogue. Of the 43, 34 were Sephardic Jews, of Spanish and Portuguese heritage. The rest were of Ashkenazic (German) German descent. Europe was a difficult place for Jews to practice their faith, so while setting sail for an untamed land was a bit scarey, it had to be better than their current situation. 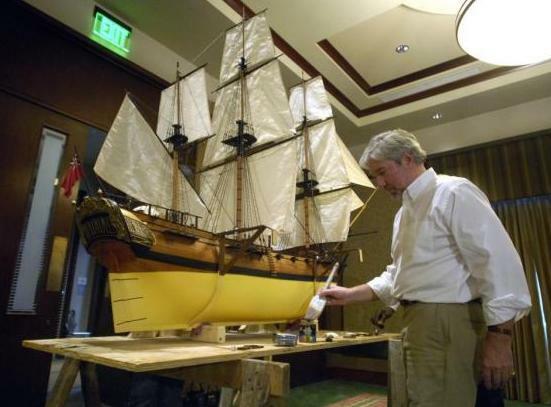 This is a replica of the ship the William and Sarah, which brought 43 Jews to Savannah from London. Photo courtesy of Hunter McRae/Savannah Morning News. Only five months before this, on orders from England’s King George II, James Oglethorpe founded Savannah as a garrison and military buffer between the English settlements farther north and Spanish Florida. Although some protested their arrival, the Jewish immigrants’ timing proved to be perfect. One of the group was a Portuguese doctor named Samuel Nunez (I’ve also seen it spelled Nunes). The colony’s only doctor had died recently and a yellow fever epidemic was taking its toll on the city. Oglethorpe allowed Dr. Nunez to begin caring for patients and when the number of deaths dropped dramatically soon after, local protests against the Jews staying in Savannah subsided. When my niece and I went to visit Frank recently, he told me that his friend, Alice, who is a cemetery enthusiast like me, knew of two very old Jewish cemeteries on the outskirts of town. The only problem was that Alice couldn’t remember exactly where they were. Trailing her in Frank’s car, we took a circuitous route through some rough parts of town and pulled several illegal traffic maneuvers in the process. It was one wild ride. You have to be a little eccentric to like cemeteries. I think Alice and I fit the bill. 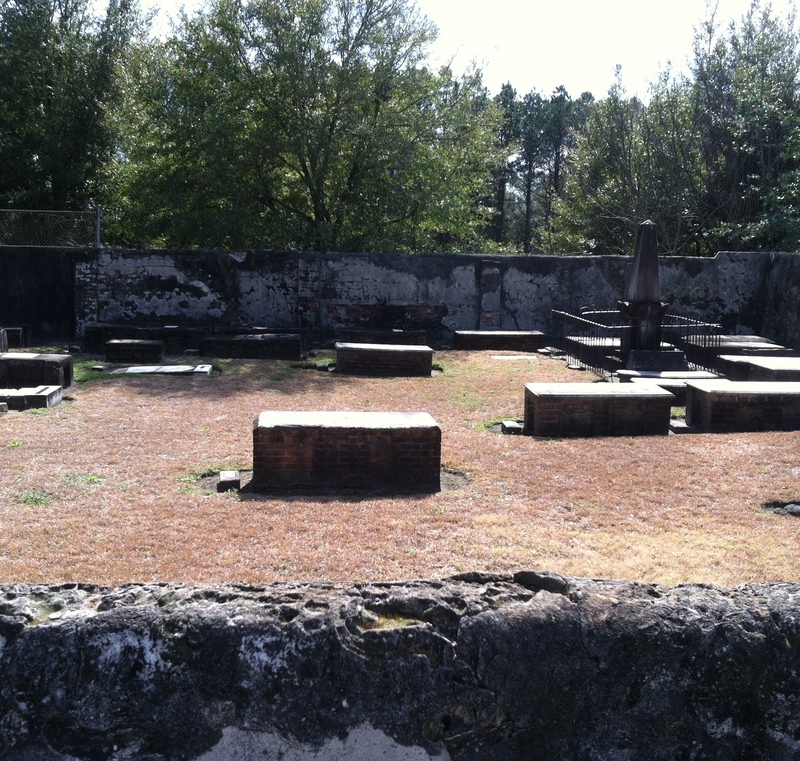 Situated beside a school and the remains of a decrepit railroad building are the Levi Sheftall Family Cemetery and the Mordecai Sheftall Cemetery (Jewish Burial Grounds). Both are enclosed by high walls and locked so you can’t go inside. 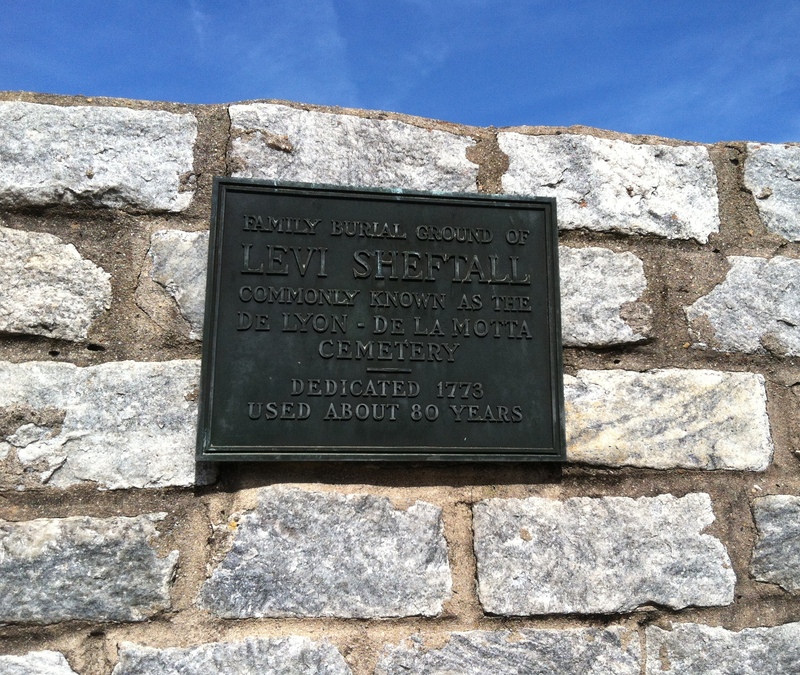 Levi Sheftall was the eldest son of Benjamin Sheftall, one of the original group that came to Savannah from London in 1733. A merchant, Levi became an influential leader in the congregation like his father. Cared for by the Congregation Temple Mikve, the cemetery is locked up. I do NOT go to illegal lengths to get inside a cemetery. But we did get a little creative. 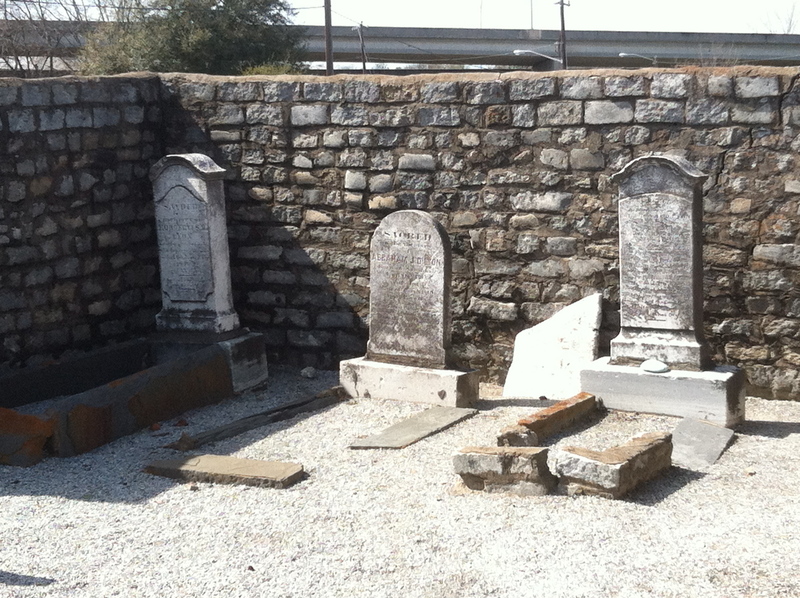 Established in 1773. the Levi Sheftall Family Cemetery was used for about 80 years. There aren’t many graves inside but there are several square stone-bordered graves and a few gravestones still standing. The walls are made out of rough stone bricks and because a few on the top have come loose over the years, Frank and I temporarily removed a few from the top and he took a few pictures for me. A closeup of the few upright gravestones still visible in the cemetery. You can see an interstate overpass in the background. 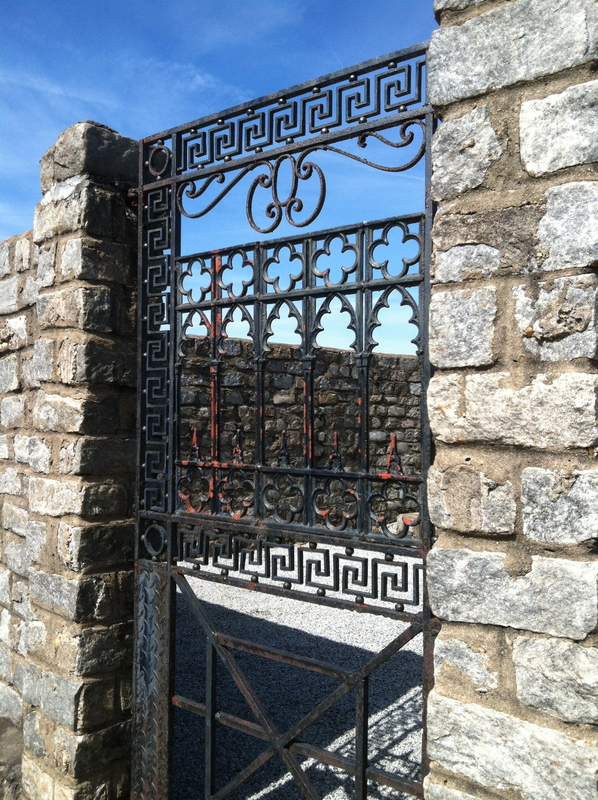 I took this picture through the bars of the iron door. Across the way is the Old Jewish Burial Ground established in 1773 by Levi’s brother, Mordecai Sheftall. This cemetery contains many more graves because it was a community cemetery and not a family one. The land parcel was granted to Mordecai by King George III in 1762. Its walls are thicker because the cemetery was involved in battle during an ill-fated French attempt to take control of Savannah from the British in 1779. The Old Jewish Burial Grounds are impossible to see from outside. So again, we had to get creative. Unfortunately, seeing inside the cemetery was impossible. I don’t hop fences or trespass to get pictures. 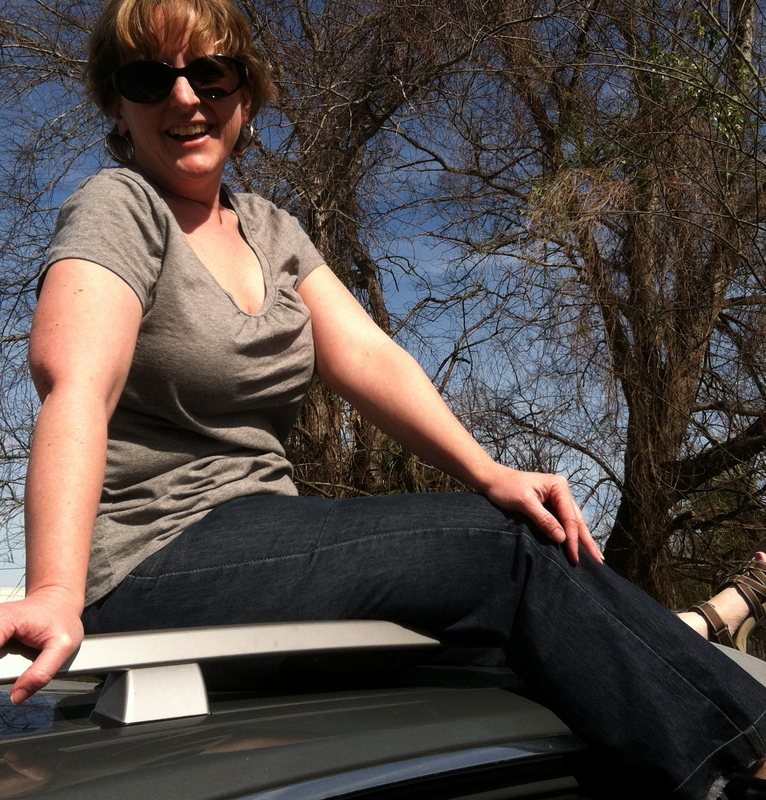 But when Alice suggested standing on top of her car to see over into the cemetery, I was only momentarily deterred. With Frank’s help, after Alice pulled her car up beside a wall, I climbed up and took some pictures. What I won’t do to see a cemetery. Thanks, Alice! 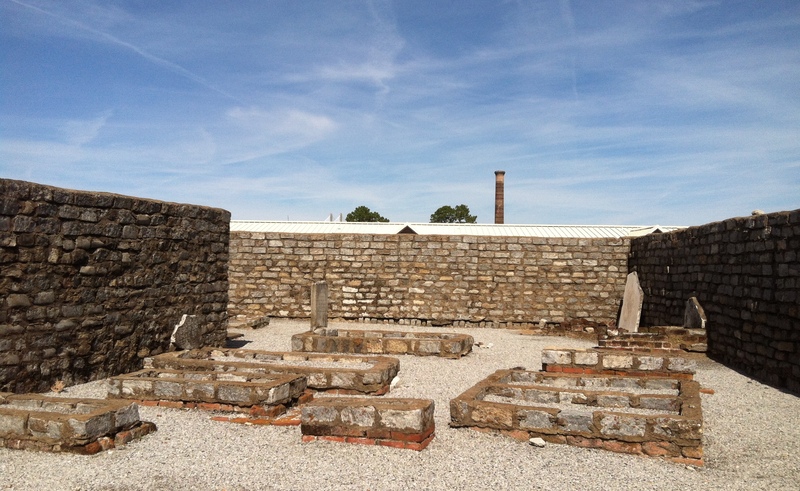 Most of the graves are of the above the ground brick box-style variety. There’s one large monument surrounded by a fence. 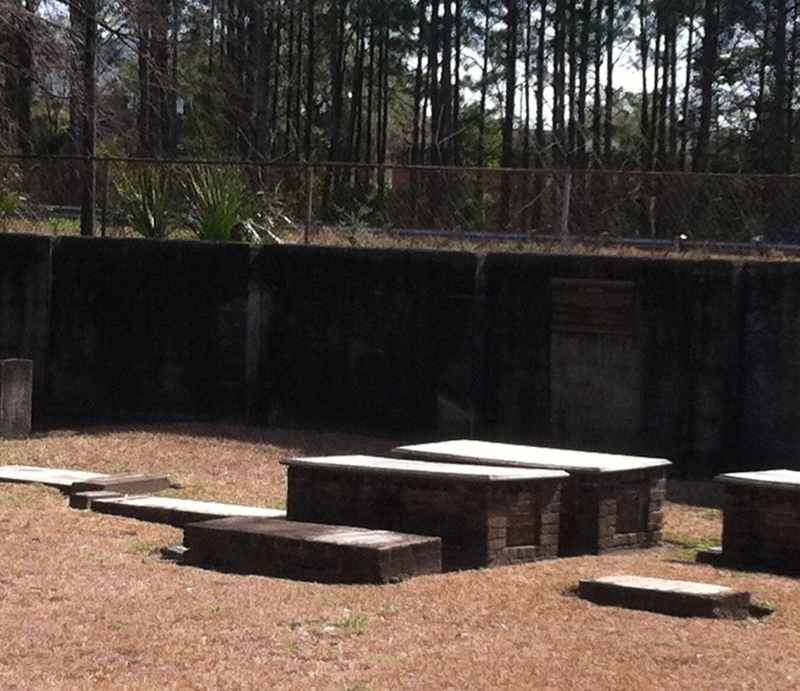 An estimated 80 or so people are buried here, but many graves are unmarked. Several metal plaques list names from the various families with members probably buried there. One of those names is Andre Daniel Nunez, son of Dr. Samuel Nunez (whose burial site is unknown). I found this out thanks to a Savannah Find a Grave volunteer who got to go inside the cemetery when Congregation Temple Mikve led a tour there. It’s not possible to know exactly who is buried here but as it was the only consecrated ground Jews could be buried in at the time, it is the most likely place. If you look at the back wall and to the right, you can see one of the memorial plaques listing the names of those thought to be buried there. 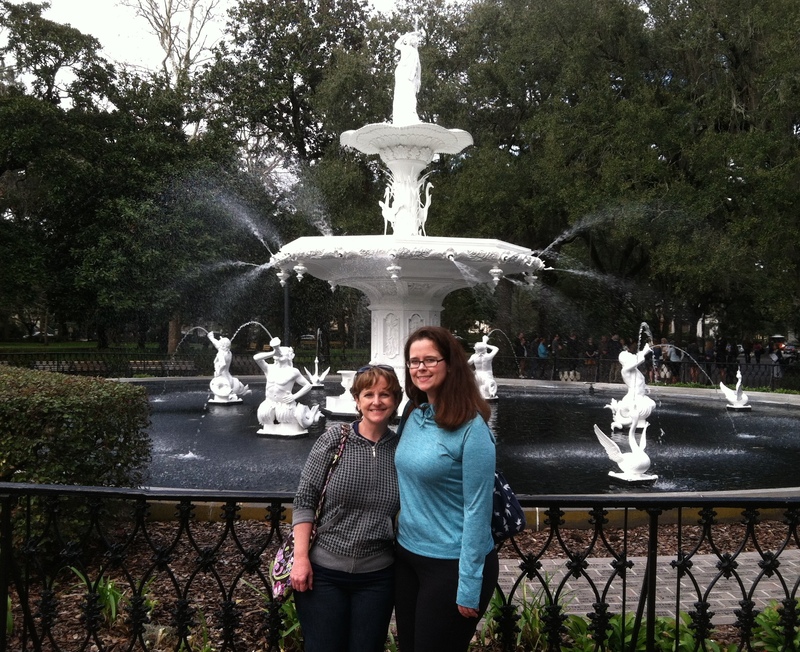 Life for Jews in Savannah was not smooth sailing. In 1742, the Spanish invaded and many Jews who had hidden under the guise of Catholicism back in Europe feared persecution. Most fled the city but some eventually returned after the Spanish were defeated at the Battle of Bloody Marsh. Despite many setbacks, the Jewish community in Savannah began to expand and thrive. In 1895, Herman Myers became the city’s first Jewish mayor. 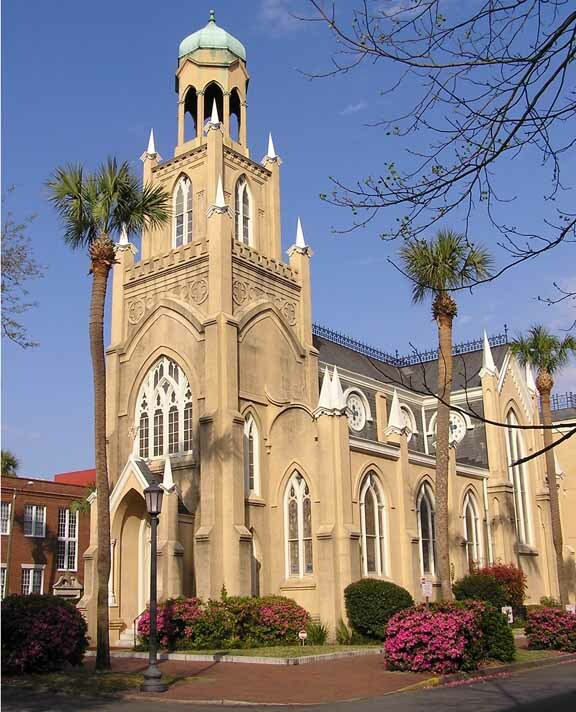 Today, there are three Jewish congregations in Savannah, with Congregation Mikve Israel (Reform) being one of them. Next week, I’ll share stories about the other cemeteries in Savannah I visited, including the one made famous by “The Book” from 1994 that turned the city into a tourist mecca. It’s also known as Midnight in the Garden of Good and Evil. 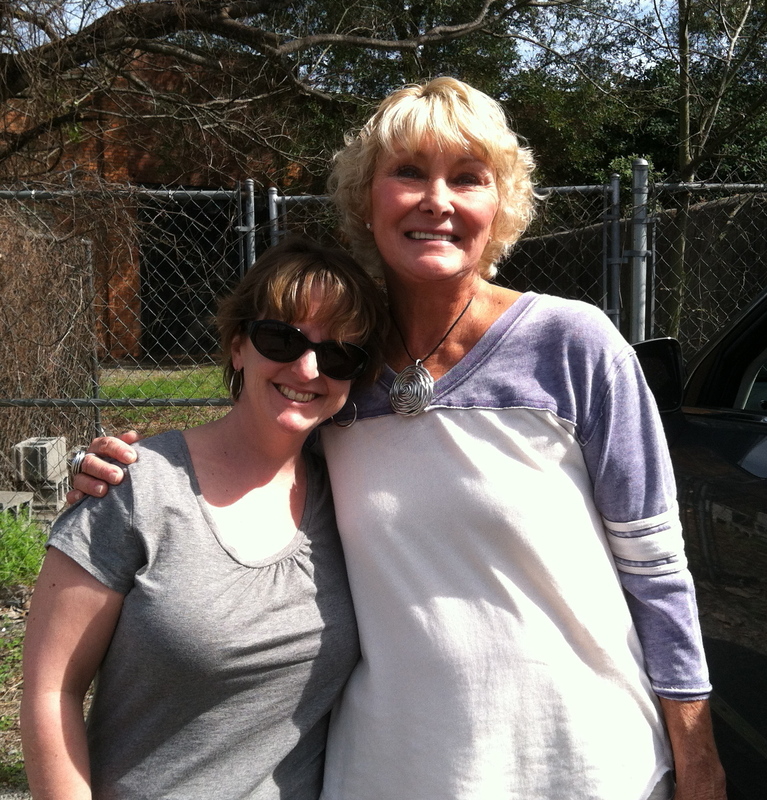 Me and my awesome niece, Hannah, who came along to make sure I didn’t get into trouble while cemetery hopping. Loved the history, pictures, and story! Always a pleasure to read. So glad you enjoyed it! I hope you are recovering well and feeling better. Oh! I’m so glad to have found this! I attended school at the school right by the two Jewish cemeteries. Garrison is the name. Chatham Steel is the big tin building across the street, and the old train station is a museum now. Anyway, some trivia! The playground was shut down when I was in the third grade. We were told that it was because of glass and such, but apparently the overpass traffic coupled with the soft ground had made artifacts and bones come up through the sand. I suspected this all along as I grew older. We would occasionally find little pieces of metal and I once even found an old train track nail. Being a small world I became good friends with a guy who was in the local paranormal group “Searchers” and he confirmed this for me! 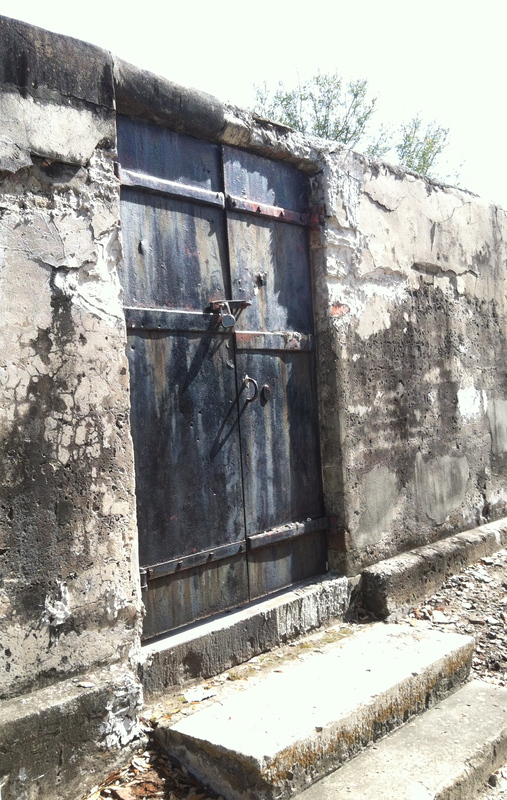 They also closed another nearby school (Gadsen) because it was built right over a cemetery and children were finding bones. But I’ve always said, Savannah is one big cemetery. The original borders for colonial park cemetery were much larger,… I live in the suburbs now, but there is always this huge heavy vibe I get when I go downtown, or if i visit familial graves to do seasonal cleaning or leave flowers. I have family buried at Laurel Grove, but dear God it’s dangerous to go there. Just wanted to leave this little trivia here for you. Going to devour the rest of your website now!